If you are not quite up to speed with Making VAT Digital, we have an update. I don't mind admiting that I do not understand the new Agent Services Account. I sure hope that mine will start doing something soon. We have this time a couple of cases which look at directors and their pay. In one case, (that's Febrey), there were unusual circumstances: clearly some horrendous accounting issues. A salary was credited to a director's loan account by persona unknown however it was not paid. The director appears to have been incredibly lucky in avoiding a Regulation 72 determination (this is where HMRC assess an employee personally for a company's PAYE liability). The FTT relied heavily on the judgment in Hochstrasser v Mayes  AC 376 (a House of Lords decision), 'Disregarding entirely contracts for full consideration in money or money’s worth and personal presents, in my judgment not every payment made to an employee is necessarily made to him as a profit arising from his employment.' Thus it is possible that an accounting entry is not always pay. I would not wish ever to argue these points! In another case (Petrol Services), the directors extracted their pay as self-employed consultancy fees so they could split income with their wives. The planning failed because there were no other employees, and the consultancy businesses had no other business and so the fees had to surely relate to their services in running the company. The moral of the story is that you can't have your cake and eat it. If you want to split income with a spouse then you need to make them a full equity shareholder in the main business. There is an interesting paper out from the Office of Tax Simplification (OTS) on Tax Tech'. The OTS admit that 'the likelihood of any effective, wholesale reform of the current tax code seems a distant and difficult objective', so the question is whether we just want machines to do all the tricky stuff without us having to think about it. I suggest that if we don't like the tricky stuff, then we probably do. I have old motorbikes, they are great. You can strip them down and rebuild them: I'm an enthusiast and part of the fun of these things is fixing them. I have a new motorbike, it's so complex that when it doesn't start they have to be transported to a dealer to fix it. That's annoying but I never for one moment worry that I don't understand its computerised engine managment system, the important thing is that I have a nice modern bike. The Office of Tax Simplification (OTS) have published “A vision for tax simplicity”, to consider how to use technology to achieve a simpler and better “user experience” without taking away taxpayer understanding and responsibility for their tax affairs. HMRC have announced the opening of a new Profit Diversion Compliance facility to allow large international groups using arrangements targeted by Diverted Profits Tax (DPT) to bring their UK tax affairs up to date. With the mandation of MTD for VAT less than 3 months away we look at recent developments and updates from HMRC ahead of the 1 April 2019 deadline. UPDATE: if you have missed the recent developments catch up here and learn more. UPDATE: what penalties apply if you can't file or pay on time. Last minute tax returns: What expenses can I claim? Our unique suite of topical guides for all directors. Need to check that you have correctly completed your tax return? Apply to beta test a new tool. UPDATE: with so many recent changes this guide summarises the rules. UPDATE: UK resident beneficiaries of offshore trusts are not just taxed on cash distributions, interest free loans and rent free accommodation are taxable benefits and are often overlooked. UPDATE: The 2019/20 ATED returns will soon be due and the rates have gone up, see our guide for the new amounts. In Petrol Service Limited v HMRC  TC06907 the FTT found that 'self employed' consultancy fees paid to the company’s directors were taxable employment income in respect of their directorships. Brexit might be looming but the old rules keep running: our guide on current rules for imports, exports, EU acquisitions and dispatches. NEW: A webinar covering private client news, legislative changes and interesting cases from the past few months. 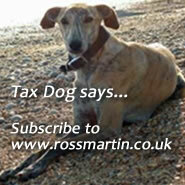 FULL access to www.rossmartin.co.uk: your firm's personal TAX INTRANET containing over 3,500 actively maintained tax guides, briefings, toolkits and checklists.